SpaceX just launched its Falcon Heavy rocket for the first time ever, and it was quite the show. The test launch did exactly what SpaceX wanted it to: Send Musk's Tesla into space. CAPE CANAVERAL, Fla. - One year ago, thousands of people were in awe as the SpaceX Falcon Heavy rocket rumbled away from NASA's Kennedy Space Center Launch Pad 39A, launching a cherry red sports car and a dummy in a spacesuit into Mars orbit. Yes, that really happened. At 3:45 p.m. on Feb. 6, 2018 Falcon Heavy fired up all 27 Merlin engines on its three boosters, lifting off from the same pad where astronauts launched to the moon almost 50 years ago. This launch was a big deal on the Space Coast. More than 100,000 people came out to watch the 20-story-tall rocket ascend into the clear blue sky over the Atlantic Ocean. In case you missed it, you can watch the epic launch below. About three minutes after the launch, Falcon Heavy's three boosters performed an amazing aerial ballet as all three came back to Earth. Two boosters successfully landed at Cape Canaveral and the third missed the drone ship in the Atlantic Ocean. Next, SpaceX won the internet by sharing video of the red Tesla -- one of SpaceX CEO Elon Musk's cars-- floating in space. It's destination was Mars orbit but the car is now on a much wider orbit around the sun. 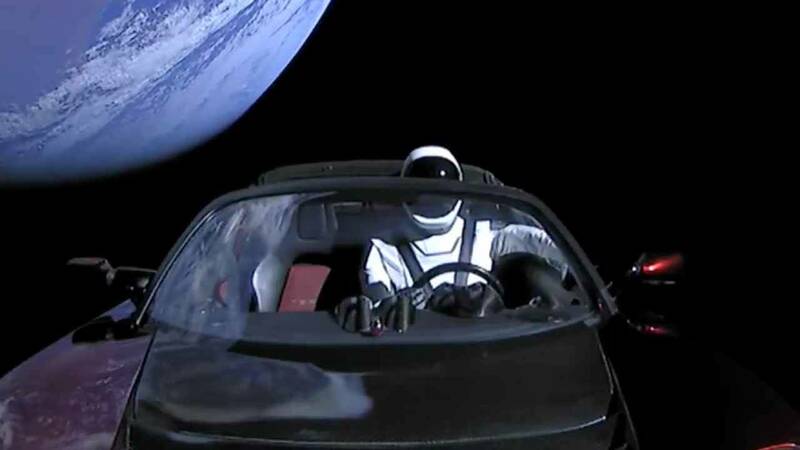 The Tesla's driver is a dummy named Starman, who is wearing a SpaceX black-and-white spacesuit, complete with helmet. The names of all SpaceX employees went along for the ride. The names are etched into the car mount. Starman and his Tesla continue into deep space one year later. The NASA Jet Propulsion Laboratory in California continues to track the Tesla convertible on its journey. The car is identified as SpaceX Roadster (spacecraft) (Tesla) -143205 in JPL’s Horizons system that tracks objects in the solar system. Click here to see what tracking Starman looks like. The private website WhereIsRoadster.com also shows a simulated version of where the roadster is in the solar system. Rewatch the hype, the launch, the landing and the view from space below. SpaceX is targeting March for the first launch of Falcon Heavy from Cape Canaveral with a spacecraft onboard. The mega rocket will deliver a communications satellite for Saudi Arabia’s Arabsat into Earth orbit.